A.Y.A Accountants can assist in setting up a business and take the stress away from the client. We provide initial advice and support and can set up a new company, notify the HMRC and make sure you comply with all the rules and regulations relating to a new business. When setting up a new business the first major decision taken is whether you wish to set up as a Sole Trader, a Partnership (Limited Liability Partnership) or a Limited Company. We can advise you as to what sort of business structure suits your business needs and which business model is the most tax efficient in the short and long term. I own a medium size company and needed an accountant who was professional and could be contacted 7 days a week. 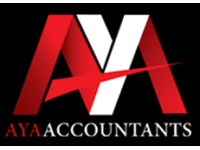 AYA Accountants provide an effienct service and saved my business a lot of money with their advice.